“Accurate diagnostics is essential in controlling an outbreak like Ebola. There is an urgent need for rapid testing to screen suspected patients and people travelling in and out of the region,” explains Dr Jim Wicks, Managing Director of Primerdesign. “Our test is quick, affordable and easy to perform,” he adds. Principle: Viruses all have a unique genetic fingerprint the same as we do. Ours is encoded in DNA but the Ebola virus uses RNA (Ribonucleic acid). So the kit is designed to specifically detect the Ebola RNA in a patient blood sample. 2. 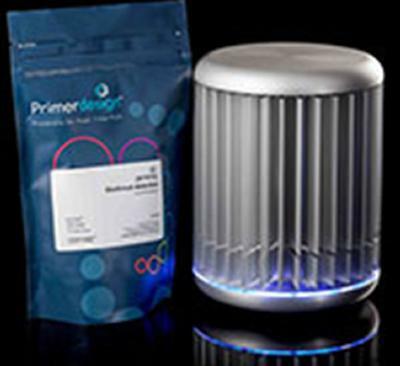 Primerdesign is a spinoff company from the University of Southampton specialising in Real-Time PCR technology. Real-Time PCR, also known as ‘qPCR’ is a mature technology based on the same DNA testing technology of ‘CSI’ fame. Primerdesign deployed the same technology during the recent horsemeat scandal in the UK and famously developed the World’s first Swine Flu detection kit in the 2009 outbreak.